A drill machine is more than a familiar tool for DIY workers and professionals. With versatility and variable applications, the different types of drill presses have grabbed enthusiasts’ attention quite remarkably. You may already possess a good understanding of the types or be looking for knowing about a particular kind. Either way, this article should help. What is a drill press used for? Simply put, you can use it to drill holes in any surface you can imagine! Different sizes of holes and very accurate depths can be made with the help of these machines. Moreover, different types of drill presses can be used for reaming, tapping, countersinking, and spot facing. Let’s learn more about each drill machine type features. In this article, you will also learn more about the functions of different drill machines. Let’s begin! If you are interested in any do-it-yourself projects, DIY house repairs on the weekends, or any other kind of works that include drilling, stay with us and learn more about different types of drill presses. Why? , you will be able to drill holes in pipelines, process the holes and prepare them for seating additional equipment parts, precisely finish the already existing holes, chamfer the hole for screw heads, as well as enlarged already existing holes. You will have to know more about each type of drilling machine to be able to use them correctly. A portable drilling machine is a perfect choice for applications that require good maneuverability due to limited space. These machines are convenient, compact, small, and usually lightweight. The greatest advantage of these types is the fact that you can use them from any position and even very small diameters. You can use them with different sizes of drills, up to 12 mm. The sensitive drilling machine is one of the special types of drill presses that is characterized by spindle head with belt drive. It is usually a small machine. It is also used for small holes. This type of machines comes only in the manual version, not the automatic one. This is why this type of machines is called “sensitive.” Experts and professional users say that they appreciate this feature of the sensitive drilling machines because they can feel each step of cutting, which allows them full control. This type should be used for light to moderate projects. You can use drills from 1,5 – 15,5-millimeter diameters with this type of machines. There are two fundamental types of sensitive drilling presses. Those are the bench and floor type. Bench mounting machines are small, lighter than most of the other types, and characterized by a foot switch. It is used to turn off the machine conveniently. As its name implies, a bench mounting drill press is mounted on a workbench. What can it be used for? This type of drill presses is mostly used for light pieces and light projects. If you want a sensitive drill press, but you also want to use it for larger projects, more demanding projects, and heavier pieces of material, you will not be able to benefit from a bench mounting type. 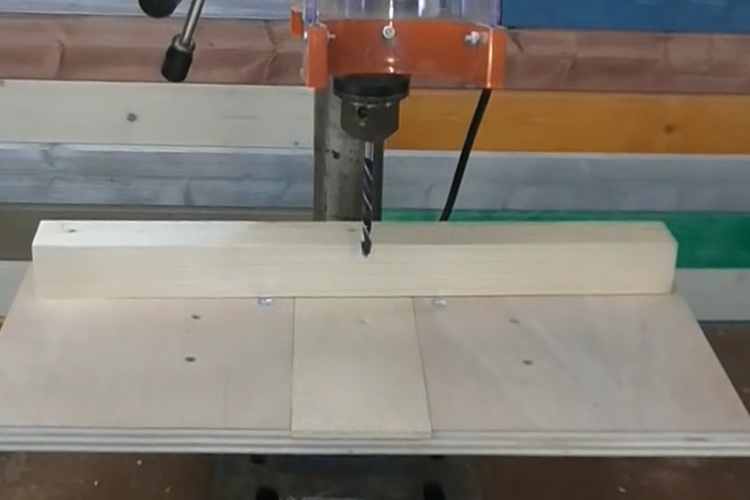 You need a floor mounting drill press. however, you need to be aware of the various issues encountered by these machines encounter. These types of drill press machines are more powerful and are the best choice for large projects. They usually come with some useful accessories too. They are fast, reliable, and great for absolutely everything, except for one thing: portability. The types of drill presses include the trendy upright drilling machine. This type is peculiar for its spindle head that has a gear drive. The most significant advantage is the fact that you can choose between automatic and manual operation mode. What is the most suitable area of application? Large holes. These types of drilling machines are the No. 1 choice for large holes. There are two main types of upright drilling machines. Those are the round column section type and the box column section type. Let’s see what each of these machines is used for. Round column section machine consists of a circular column, as its name implies, and it is used for lighter projects. The reason why it is not so suitable for heavy-duty materials is the fact that it has less strength than other types of drilling machines. Box column type has the same characteristics as the round column type, except the box column section, which makes it stand out. It gives this type of machine lots of strength. It is also more rigid, and it is perfect for more demanding projects. Here we come to the types of drilling machines that are the absolute winners when it comes to popularity among different categories of users – the radial drilling machines. Key advantages of this type include extreme versatility, flexibility, superior dominance in operating on large projects and heavy and demanding pieces, as well as excellent maneuverability and easy manipulation over the machine. Also, skilled users usually combine it with a tilting table. There are three main types of radial drilling machines. Those include the plain, semi-universal, and universal drill press. Let’s learn more about each of these types. Plain type of the radial drill press is peculiar for movements in three directions. First of all, you can use the plain machine to make vertical column arm movements. Secondly, you can use it to make horizontal drill movements along the machine arm. Finally, plain mechanisms are suitable for circular motions as well. The arm circulates the column. Semi-universal drill press has the same three options of movement as the above described plain type, plus the additional movement which can be described as the head swinging around the horizontal arm axis. Therefore, this type is even more versatile and advanced than plain models. Universal radial drilling machines are excellent if you need to perform rotation of the drill head arm. Why is this important? This movement is crucial for any job that requires angled drilling. One of the essential types of drill machine models on the market includes the gang drilling machine. It is peculiar for its numerous single spindle columns located on the same machine base. This allows performing many operations on different positions of the worktable. This is exactly why this machine type is called “gang drilling” machine, and it is also the reason why we use it for industrial purposes and mass production. Multiple spindle drilling press is the best choice if you want a tool that drills many holes at the same time. Besides, this machine is perfect for making the same holes and following a specific pattern. This is why this type is also used for industrial mass production, like the previous, gang drilling type. As its name itself implies, an automatic drill press is the best choice for repetitive and automatized production. With a very easy setup process, it is suitable for the type of projects that do not require lots of human interaction. Such machines are usually very adjustable and have the swing mechanism. Their greatest advantages include saving time, money, and human effort, as well as producing identical results on similar pieces of material. This type of drill machine is capable of making holes with hole depth to diameter ratio equal to or larger than 10:1. These machines are perfect for gun barrels and industrial applications that require deep holes. Such machines are used in projects which cannot be made even with the CNC machines. This is why this type is considered to be one of the most advanced types of drilling presses. These are accurate, convenient, and reliable machines. There are two main types of deep hole drilling presses. Those are the vertical type and the horizontal deep hole drilling machine type. Let’s learn the basics of both of these types. These amazing machines are perfect for boring, reaming, enlarging, etc. of deep holes with movements along the vertical axis. Most of the vertical deep hole drilling presses on the market today have the mechanical transmission system. They also have a superb method of rotation segment adjustments, which allows excellent precision and convenience. The drill machine (for horizontal deep holes) is perfect for making deep horizontal holes. They are versatile and adjustable so that you can make the holes at any point in the coordinate system. In fine, drill presses are amazing and versatile tools you can significantly benefit from. Remember that different types of drill presses require almost the same safety measures. When using a drill press, you must learn how your specific model of drill press works. You must read the manual very carefully and always stick to the manufacturer’s rules and guidelines. Moreover, you must always wear safety equipment, including goggles. Don’t wear jewelry and lose clothes. Also, you should always use the original drill machine parts, especially when it comes to the drills themselves. Don’t forget to secure your piece you are working on, fasten it, and to hold it firmly. Disconnect the machine from the power supply as soon as your work is over. Then, gently wipe off the dust and clean the machine before placing it in its storage box. 5 How Does a Drywall Screw Gun Work? 6 How Does a Wood Jointer Work? Learn the Mechanism Behind It!